Some people who do not have dogs and even some dog owners do not understand dog owners who have a wardrobe of clothing for their dogs. I, myself, have two toy dogs and yes they do have dog clothing. One is a Yorkie and the other is a Chi-Pom. In the winter they wear sweaters when taken outside for walks or for a car ride. They both weigh under 10 pounds so they do require sweaters in order to stay warm. Recently, I purchased pajamas for both of them. 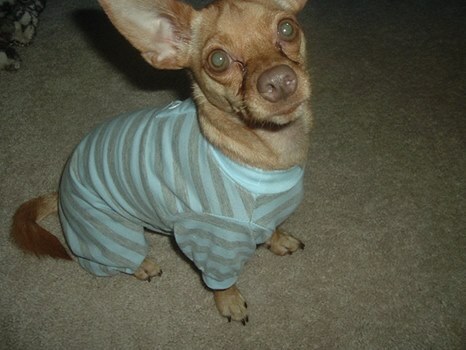 The first pajama I bought was a size small and it was too small on my smallest dog my Chi-Pom. So, I bought a medium size for both of them. The medium pajama fits my Yorkie perfectly; for my Chi-Pom not so much. In fact, I have taken to the sewing machine about five times trying to get his pajama to fit him properly. Right now, it is not perfect but a lot better than when I first brought the pajama home for him. 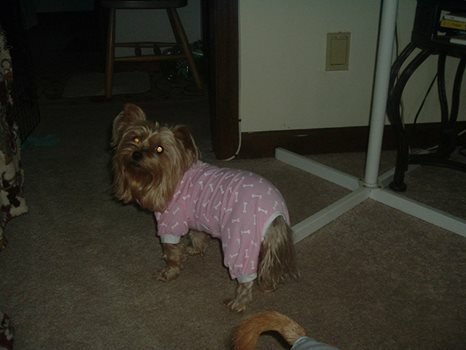 I have to say that both of my dogs really enjoy wearing pajamas at night and willingly come to me to have them put on. My complaint is that dog clothing can only be bought in a small, medium, or large. Why hasn’t someone come out with actual sizes? Every dog is different as even in the case of my dogs which weigh almost the same but obviously their body types differ. It would be great if dog owners could purchase dog clothing that comes in sizes instead of just small, medium, or large. A type of sizing similar to what humans have available would be very popular to us toy dog owners!